Reviewer's comments: Larger LCDs as a general rule don't have quite the accuracy of their smaller brethren, but the SyncMaster 215TW goes a long way to closing that gap. We have reviewed a ton of LCD monitors over the years and while the quality has risen to a point where almost all CRTs in the lab have been replaced with high-performance LCDs, they are not quite perfect at larger sizes. It seems that the quality for LCDs tops out around 19 inches. In our testing over the years, it is a pretty safe bet that if you put a high-performance 19-inch LCD beside a high-performance 21- or 23-inch LCD, that the smaller one is going to display images more clearly. And if the larger LCD is oriented into a widescreen 16:9 ratio instead of the somewhat more standard 4:3, it has an even bigger mountain to climb. Samsung is trying to change that with the SyncMaster 215TW, a 21-inch widescreen LCD with plenty of whistles and bells, and a sharp picture quality as well. In terms of overall specifications, the 215TW is about as impressive as any LCD currently made. With a 1,000:1 contrast ratio and a fast 8 ms response time, even a quick-displaying program like the chart-drawing component of the GCN/Alterion benchmark is displayed accurately. Add in a respectable 0.27mm pixel pitch, and you have the recipe for good image display. Testing 215TW with the DisplayMate video benchmark yielded good results. Greens and reds were accurately displayed and very fine details were captured as well. The blues displayed by the 215TW were extremely vivid, though not perfectly accurate. The display of good video requires a vivid blue, so it is no surprise that the 215TW seems optimized for this given its movie screen 16:9 ratio. Surprisingly, the reds and greens are not compromised despite the blue skew. The one area it had a little trouble with is the display of very light images over a white or light background. This is always a problem area for larger displays, though the 215TW handles it better than most. And if you happen to be thinking of using the 215TW as a work monitor that is also able to display your favorite TV show after hours or even CNN or a related business feed during the day, you are in luck. The 215TW is HDTV-ready. 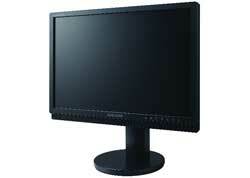 There are a lot of inputs on the 215TW, including DVI, S-Video, composite, and component. There is even an old Analog connection, though for best results you should use the DVI port if you have a video card that supports it. All our performance tests were conducted with the DVI port. In terms of extra features, two of the coolest are the picture-in-picture display and picture-by-picture display. The first puts a second image inside the area of the main picture while the other throws the second image beside the first, sharing the screen completely with it. Amazingly, there does not seem to be any loss of quality with either image even when both are on the screen. This of course has to take into account the source of the second image if the first is being provided through DVI. An analog image is not going to look as good naturally, but is not further degraded by having to share screen real estate with the digital feed. The digital feed is unharmed. The 215TW also does its best to keep all adjustments automatic. You don't have to press any buttons when changing resolutions. We tested this with some quirky programs that tended to confuse certain other LCDs. But the 215TW was onto our ploy and automatically adjusted itself every time with very little interruption. While we were pleasantly surprised by this large LCD's overall performance and color accuracy, we were most impressed by the cost. At just $499, the 215TW is really priced as if it were a far smaller display. And that $499 is the list price without factoring in any government discounts you may be able to get from the GSA schedule. Everyone probably knows by now that a bigger monitor is better, but for just watching movies, there are also a lot of advantages to a 16:9 wide screen. Having multiple windows open at the same time is possible in Microsoft XP, but really comes of age with some of the visual wizardry found in Vista. We've had trouble reliably recommending bigger monitors with wide screens though. The 215TW still has a couple minor flaws compared to smaller panel displays, but is one of the best we have seen in its class. And it's obvious that the class is changing for the better.